Not to be confused with Eddie Murphy. Audie Leon Murphy (20 June 1925 – 28 May 1971) was one of the most decorated American combat soldiers of World War II. He received every military combat award for valor available from the U.S. Army, as well as French and Belgian awards for heroism. Murphy received the Medal of Honor for valor that he demonstrated at the age of 19 for single-handedly holding off an entire company of German soldiers for an hour at the Colmar Pocket in France in January 1945, then leading a successful counterattack while wounded and out of ammunition. Murphy was born into a large family of sharecroppers in Hunt County, Texas. His father abandoned them, and his mother died when he was a teenager. Murphy left school in fifth grade to pick cotton and find other work to help support his family; his skill with a hunting rifle helped feed his family. Brush Mountain, near Catawba, Craig County, Virginia, U.S.
After the attack on Pearl Harbor in 1941, Murphy's older sister helped him to falsify documentation about his birthdate in order to meet the minimum-age requirement for enlisting in the military. Turned down by the Navy and the Marine Corps, he enlisted in the Army. He first saw action in the 1943 Allied invasion of Sicily; then in 1944 he participated in the Battle of Anzio, the liberation of Rome, and the invasion of southern France. Murphy fought at Montélimar and led his men on a successful assault at the L'Omet quarry near Cleurie in northeastern France in October. After the war, Murphy embarked on a 21-year acting career. He played himself in the 1955 autobiographical film To Hell and Back, based on his 1949 memoirs of the same name, but most of his roles were in westerns. He made guest appearances on celebrity television shows and starred in the series Whispering Smith. Murphy was a fairly accomplished songwriter. He bred quarter horses in California and Arizona, and became a regular participant in horse racing. Suffering from what would today be described as post traumatic stress disorder (PTSD), Murphy slept with a loaded handgun under his pillow. He looked for solace in addictive sleeping pills. In his last few years, he was plagued by money problems but refused offers to appear in alcohol and cigarette commercials because he did not want to set a bad example. Murphy died in a plane crash in Virginia in 1971, which was shortly before his 46th birthday. He was interred with full military honors at Arlington National Cemetery, where his grave is one of the most visited. Murphy was the seventh of twelve children born to Emmett Berry Murphy and his wife Josie Bell Killian in Kingston, Texas. [ALM 1] The Murphys were sharecroppers of Irish descent. As a child, Murphy was a loner with mood swings and an explosive temper. He grew up in Texas, around Farmersville, Greenville, and Celeste, where he attended elementary school. His father drifted in and out of the family's life and eventually deserted them. Murphy dropped out of school in fifth grade and got a job picking cotton for a dollar a day (equivalent to $18 in 2018) to help support his family; he also became skilled with a rifle, hunting small game to help feed them. After his mother died of endocarditis and pneumonia in 1941, he worked at a radio repair shop and at a combination general store, garage and gas station in Greenville. Hunt County authorities placed his three youngest siblings in Boles Children's Home, a Christian orphanage in Quinlan. After the war, he bought a house in Farmersville for his eldest sister Corinne and her husband, Poland Burns. His other siblings briefly shared the home. She died when I was sixteen. She had the most beautiful hair I've ever seen. It reached almost to the floor. She rarely talked; and always seemed to be searching for something. What it was I don't know. We didn't discuss our feelings. But when she passed away, she took something of me with her. It seems I've been searching for it ever since. Murphy had always wanted to be a soldier. After the Japanese attack on Pearl Harbor in December 1941, he tried to enlist, but the Army, Navy and Marine Corps all turned him down for being underweight and underage. After his sister provided an affidavit that falsified his birth date by a year, he was accepted by the U.S. Army on 30 June 1942. [ALM 1][ALM 2] After basic training at Camp Wolters, he was sent to Fort Meade for advanced infantry training. During basic training, he earned the Marksman Badge with Rifle Component Bar and Expert Badge with Bayonet Component Bar. Murphy was shipped to Casablanca in French Morocco on 20 February 1943. He was assigned to Company B, 1st Battalion, 15th Infantry Regiment, 3rd Infantry Division, which trained under the command of Major General Lucian Truscott. He participated as a platoon messenger with his division at Arzew in Algeria in rigorous training for the Allied assault landings in Sicily. He was promoted to private first class on 7 May and corporal on 15 July. When the 3rd Infantry landed at Licata, Sicily, on 10 July, Murphy was a division runner. On a scouting patrol, he killed two fleeing Italian officers near Canicattì. Sidelined with illness for a week when Company B arrived in Palermo on 20 July, he rejoined them when they were assigned to a hillside location protecting a machine-gun emplacement, while the rest of the 3rd Infantry Division fought at San Fratello en route to the Allied capture of the transit port of Messina. 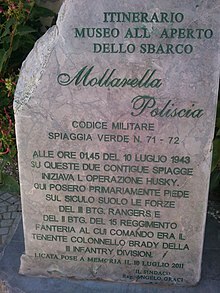 Murphy participated in the September 1943 mainland Salerno landing at Battipaglia. While on a scouting party along the Volturno River, he and two other soldiers were ambushed; German machine gun fire killed one soldier. Murphy and the other survivor responded by killing five Germans with hand grenades and machine gun fire. While taking part in the October Allied assault on the Volturno Line, near Mignano Monte Lungo Hill 193, he and his company repelled an attack by seven German soldiers, killing three and taking four prisoner. Murphy was promoted to sergeant on 13 December. In January 1944, Murphy was promoted to staff sergeant. He was hospitalized in Naples with malaria on 21 January and was unable to participate in the initial landing at the Anzio beachhead. He returned on 29 January and participated in the First Battle of Cisterna, and was made a platoon sergeant in Company B following the battle. He returned with the 3rd Division to Anzio, where they remained for months. Taking shelter from the weather in an abandoned farmhouse on 2 March, Murphy and his platoon killed the crew of a passing German tank. He then crawled out alone close enough to destroy the tank with rifle grenades, for which he received the Bronze Star with "V" device. Murphy continued to make scouting patrols to take German prisoners before being hospitalized for a week on 13 March with a second bout of malaria. Sixty-one infantry officers and enlisted men of Company B, 15th Infantry, including Murphy, were awarded the Combat Infantryman Badge on 8 May. Murphy was awarded a Bronze Oak Leaf Cluster for his Bronze Star. American forces liberated Rome on 4 June, and Murphy remained bivouacked in Rome with his platoon throughout July. During the first wave of the Allied invasion of southern France, Murphy received the Distinguished Service Cross for action taken on 15 August 1944. After landing on Yellow Beach near Ramatuelle, Murphy's platoon was making its way through a vineyard when the men were attacked by German soldiers. He retrieved a machine gun that had been detached from the squad and returned fire at the German soldiers, killing two and wounding one. Two Germans exited a house about 100 yards (91 m) away and appeared to surrender; when Murphy's best friend responded, they shot and killed him. Murphy advanced alone on the house under direct fire. He killed six, wounded two and took 11 prisoner. Murphy was with the 1st Battalion, 15th Infantry Regiment during the 27–28 August offensive at Montélimar that secured the area from the Germans. Along with the other soldiers who took part in the action, he received the Presidential Unit Citation. Murphy's first Purple Heart was for a heel wound received in a mortar shell blast on 15 September 1944 in northeastern France. His first Silver Star came after he killed four and wounded three at a German machine gun position on 2 October at L'Omet quarry in the Cleurie river valley. Three days later, Murphy crawled alone towards the Germans at L'Omet, carrying an SCR-536 radio and directing his men for an hour while the Germans fired directly at him. When his men finally took the hill, 15 Germans had been killed and 35 wounded. Murphy's actions earned him a Bronze Oak Leaf Cluster for his Silver Star. He was awarded a battlefield commission to second lieutenant on 14 October, which elevated him to platoon leader. While en route to Brouvelieures on 26 October, the 3rd Platoon of Company B was attacked by a German sniper group. Murphy captured two before being shot in the hip by a sniper; he returned fire and shot the sniper between the eyes. At the 3rd General Hospital at Aix-en-Provence, the removal of gangrene from the wound caused partial loss of his hip muscle and kept him out of combat until January. Murphy received his first Bronze Oak Leaf Cluster for his Purple Heart for this injury. The Colmar Pocket, 850 square miles (2,200 km2) in the Vosges Mountains, had been held by German troops since November 1944. On 14 January 1945, Murphy rejoined his platoon, which had been moved to the Colmar area in December. He moved with the 3rd Division on 24 January to the town of Holtzwihr, where they faced a strong German counterattack. He was wounded in both legs, for which he received a second Bronze Oak Leaf Cluster for his Purple Heart. As the company awaited reinforcements on 26 January, he was made commander of Company B. The Germans scored a direct hit on an M10 tank destroyer, setting it alight, forcing the crew to abandon it. Murphy ordered his men to retreat to positions in the woods, remaining alone at his post, shooting his M1 carbine and directing artillery fire via his field radio while the Germans aimed fire directly at his position. Murphy mounted the abandoned, burning tank destroyer and began firing its .50 caliber machine gun at the advancing Germans, killing a squad crawling through a ditch towards him. For an hour, Murphy stood on the flaming tank destroyer returning German fire from foot soldiers and advancing tanks, killing or wounding 50 Germans. He sustained a leg wound during his stand, and stopped only after he ran out of ammunition. Murphy rejoined his men, disregarding his own injury, and led them back to repel the Germans. He insisted on remaining with his men while his wounds were treated. For his actions that day, he was awarded the Medal of Honor. The 3rd Infantry Division was awarded the Presidential Unit Citation for its actions at the Colmar Pocket, giving Murphy a Bronze Oak Leaf Cluster for the emblem. On 16 February, Murphy was promoted to first lieutenant and was awarded the Legion of Merit for his service from 22 January 1944 to 18 February 1945. He was moved from the front lines to Regimental Headquarters and made a liaison officer. The United States additionally honored Murphy's war contributions with the American Campaign Medal, the European–African–Middle Eastern Campaign Medal with arrowhead device and 9 campaign stars, the World War II Victory Medal, and the Army of Occupation Medal with Germany Clasp. France recognized his service with the French Legion of Honor – Grade of Chevalier, the French Croix de guerre with Silver Star, the French Croix de guerre with Palm, the French Liberation Medal and the French Fourragère in Colors of the Croix de guerre, which was authorized for all members of the 3rd Infantry Division who fought in France during World War II. Belgium awarded Murphy the Belgian Croix de guerre with 1940 Palm. Brigadier General Ralph B. Lovett and Lieutenant Colonel Hallet D. Edson recommended Murphy for the Medal of Honor. Near Salzburg, Austria on 2 June 1945, Lieutenant General A.M. Patch presented Murphy with the Medal of Honor and Legion of Merit for his actions at Holtzwihr. When asked after the war why he had seized the machine gun and taken on an entire company of German infantry, he replied, "They were killing my friends." Inquiries were made through official channels about the prospect of Murphy attending West Point upon his return to the United States, but he never enrolled. According to author Don Graham, Murphy suggested the idea and then dropped it, possibly when he realized the extent of academic preparation needed to pass the entrance exam. Murphy was one of several military personnel who received orders on 8 June 1945 to report to Fort Sam Houston in San Antonio, Texas, for temporary duty and reassignment. Upon arrival on 13 June, he was one of four assigned to Fort Sam Houston Army Ground & Services Redistribution Station and sent home for 30 days of recuperation, with permission to travel anywhere within the United States during that period. While on leave, Murphy was feted with parades, banquets, and speeches. He received a belated Good Conduct Medal on 21 August. Since his military service, Murphy had been plagued with insomnia and bouts of depression, and he slept with a loaded pistol under his pillow. A post-service medical examination on 17 June 1947 revealed symptoms of headaches, vomiting, and nightmares about the war. His medical records indicated that he took sleeping pills to help prevent nightmares. During the mid-1960s, he recognized his dependence on Placidyl, and locked himself alone in a hotel room for a week to successfully break the addiction. Post-traumatic stress levels exacerbated his innate moodiness, and surfaced in episodes that friends and professional colleagues found alarming. His first wife, Dixie Wanda Hendrix, claimed he once held her at gunpoint. She witnessed her husband being guilt-ridden and tearful over newsreel footage of German war orphans. Murphy briefly found a creative stress outlet in writing poetry after his Army discharge. His poem "The Crosses Grow on Anzio" appeared in his book To Hell and Back, but was attributed to the fictitious character Kerrigan. In an effort to draw attention to the problems of returning Korean War and Vietnam War veterans, Murphy spoke out candidly about his own problems with posttraumatic stress disorder. It was known during Murphy's lifetime as "battle fatigue" and "shell shock", terminology that dated back to World War I. He called on the government to give increased consideration and study to the emotional impact of combat experiences, and to extend health care benefits to war veterans. As a result of legislation introduced by U.S. Congressman Olin Teague five months after Murphy's death in 1971, the Audie L. Murphy Memorial VA Hospital in San Antonio, now a part of the South Texas Veterans Health Care System, was dedicated in 1973. At the end of World War II, the 36th Infantry Division reverted to state control as part of the Texas Army National Guard, and Murphy's friends, Major General H. Miller Ainsworth and Brigadier General Carl L. Phinney, were the 36th's commander and deputy commander respectively. After the 25 June 1950 commencement of the Korean War, Murphy began a second military career and was commissioned as a captain in the 36th Infantry Division of the Texas Army National Guard. He drilled new recruits in the summer training camps, and granted the Guard permission to use his name and image in recruiting materials. Although he wanted to join the fighting and juggled training activities with his film career, the 36th Infantry Division was never sent to Korea. At his request, he transferred to inactive status on 1 October 1951 because of his film commitments with MGM Studios, and returned to active status in 1955. Murphy was promoted to the rank of major by the Texas Army National Guard in 1956 and returned to inactive status in 1957. In 1969, his official separation from the Guard transferred him to the United States Army Reserve. He remained with the USAR until his transfer to the Retired Reserve in 1969. Throughout an acting career spanning from 1948 to 1969, Murphy made more than 40 feature films and one television series. [ALM 5] When actor and producer James Cagney saw the 16 July 1945 issue of Life magazine depicting Murphy as the "most decorated soldier", he brought him to Hollywood. Cagney and his brother William signed him as a contract player for their production company and gave him training in acting, voice and dance. They never cast Murphy in a movie and a personal disagreement ended the association in 1947. Murphy later worked with acting coach Estelle Harman, and honed his diction by reciting dialogue from William Shakespeare and William Saroyan. Murphy moved into Terry Hunt's Athletic Club in Hollywood where he lived until 1948. Hollywood writer David "Spec" McClure befriended Murphy, collaborating with him on Murphy's 1949 book To Hell and Back. McClure used his connections to get Murphy a $500 (equivalent to $5,000 in 2018) bit part in Texas, Brooklyn and Heaven. The agent of Wanda Hendrix, whom he had been dating since 1946, got him a bit part in the 1948 Alan Ladd film Beyond Glory directed by John Farrow. His 1949 film Bad Boy gave him his first leading role. The film's financial backers refused to bankroll the project unless Murphy was given the lead; thus, Allied Artists put aside their reservations about using an inexperienced actor and gave him the starring role. Universal Studios signed Murphy to a seven-year studio contract at $2,500 a week (equivalent to $26,000 in 2018). His first film for them was as Billy the Kid in The Kid from Texas in 1950. He wrapped up that year making Sierra starring Wanda Hendrix, who by that time had become his wife, and Kansas Raiders as outlaw Jesse James. Universal lent him to MGM in 1951 at a salary of $25,000 to play the lead of The Youth[ALM 6] in The Red Badge of Courage, directed by John Huston. Murphy and Huston worked together again in the 1960 film The Unforgiven. The only film Murphy made in 1952 was The Duel at Silver Creek with director Don Siegel. Murphy worked with Siegel one more time in 1958 for The Gun Runners. In 1953, he starred in Frederick de Cordova's Column South, and played Jim Harvey in Nathan Juran's Tumbleweed, an adaptation of the Kenneth Perkins novel Three Were Renegades. Director Nathan Juran also directed Gunsmoke and Drums Across the River. George Marshall directed Murphy in the 1954 Destry, a remake of Destry Rides Again, based on a character created by author Max Brand. Although Murphy was initially reluctant to appear as himself in To Hell and Back, the 1955 adaptation of his book directed by Jesse Hibbs, he eventually agreed; it became the biggest hit in the history of Universal Studios at the time. To help publicize the release of the film, he made guest appearances on television shows such as What's My Line?,[ALM 7] Toast of the Town, and Colgate Comedy Hour. [ALM 8] The Hibbs-Murphy team proved so successful in To Hell and Back that the two worked together on five subsequent films. The partnership resulted in the 1956 western Walk the Proud Land, and the non-westerns Joe Butterfly and World in My Corner. They worked together for the last time in the 1958 western Ride a Crooked Trail. Joseph L. Mankiewicz hired Murphy to play the titular role[ALM 9] in the 1958 film The Quiet American. Murphy formed a partnership with Harry Joe Brown to make three films, starting with The Guns of Fort Petticoat (1957). The partnership fell into disagreement over the remaining two projects, and Brown filed suit against Murphy. Murphy was featured in three westerns in 1959: he starred opposite Sandra Dee in The Wild and the Innocent, collaborated as an uncredited co-producer with Walter Mirisch on the black and white Cast a Long Shadow, and performed as a hired killer in No Name on the Bullet, a film that was well received by critics. Thelma Ritter was his costar in the 1960 Startime television episode "The Man". During the early 1960s, Murphy donated his time and otherwise lent his name and image for three episodes of The Big Picture television series produced by the United States Army. He received the 1960 Outstanding Civilian Service Medal for his cooperation in the episode Broken Bridge, which featured his visits to military installations in Germany, Italy, Turkey and the U.S. state of New Mexico to showcase the military's latest weaponry. Writer Clair Huffaker wrote the 1961 screenplays for Murphy's films Seven Ways from Sundown and Posse from Hell. Willard W. Willingham and his wife Mary Willingham befriended Murphy in his early days in Hollywood and worked with him on a number of projects. Willard was a producer on Murphy's 1961 television series Whispering Smith, and co-wrote the screenplay for Battle at Bloody Beach that year. He collaborated on Bullet for a Badman in 1964 and Arizona Raiders in 1965. The Willinghams as a team wrote the screenplay for Gunpoint as well as the script for Murphy's last starring lead in the western 40 Guns to Apache Pass in 1967. Murphy made Trunk to Cairo in Israel in 1966. He first met director Budd Boetticher when Murphy requested to be his boxing partner at Terry Hunt's Athletic Club. He subsequently appeared in the 1951 title role of Boetticher's first western The Cimarron Kid. Boetticher wrote the script in 1969 for Murphy's last film, A Time for Dying. Two other projects that Murphy and Boetticher planned to collaborate on – A Horse for Mr Barnum and When There's Sumpthin' to Do – never came to fruition. Murphy married actress Wanda Hendrix in 1949. Their divorce became final two years later in 1951. Four days later, he married former airline stewardess Pamela Opal Lee Archer (October 7, 1919/1920/1923 – April 8, 2010), with whom he had two sons: Terry Michael (born 14 March 1952), and James Shannon (born 1954). His horses raced at the Del Mar Racetrack, and he invested large sums of money in the hobby. Murphy's gambling left his finances in a poor state. In 1968, he stated that he lost $260,000 in an Algerian oil deal and was dealing with the Internal Revenue Service over unpaid taxes. In spite of his financial difficulties, Murphy refused to appear in commercials for alcohol and cigarettes, mindful of the influence he would have on the youth market. On 28 May 1971, Murphy was killed when the private plane in which he was a passenger crashed into Brush Mountain, near Catawba, Virginia, 20 miles (32 km) west of Roanoke in conditions of rain, clouds, fog and zero visibility. The pilot and four other passengers were also killed. The aircraft was a twin-engine Aero Commander 680 flown by a pilot who had a private-pilot license and a reported 8,000 hours of flying time, but who held no instrument rating. The aircraft was recovered on 31 May. After her husband's death, Pamela Murphy moved into a small apartment and got a clerk position at the Sepulveda Veterans Administration Hospital in Los Angeles, where she remained employed for 35 years. In 1975, a court awarded Murphy's widow, Pamela, and their two children $2.5 million in damages because of the accident. On 7 June 1971, Murphy was buried with full military honors at Arlington National Cemetery. In attendance were Ambassador to the U.N. George H.W. Bush, Army Chief of Staff William Westmoreland, and many of the 3rd Infantry Division. Murphy's gravesite is in Section 46, headstone number 46-366-11, located across Memorial Drive from the Amphitheater. A special flagstone walkway was later constructed to accommodate the large number of people who visit to pay their respects. It is the cemetery's second most-visited gravesite, after that of President John F. Kennedy. The headstones of Medal of Honor recipients buried at Arlington National Cemetery are normally decorated in gold leaf. Murphy previously requested that his stone remain plain and inconspicuous, like that of an ordinary soldier. The headstone contains the birth year 1924, based upon purportedly falsified materials among his military records. In 1974, a large granite marker was erected just off the Appalachian Trail at 37°21′52″N 80°13′33″W﻿ / ﻿37.364554°N 80.225748°W﻿ / 37.364554; -80.225748﻿ (Audie Murphy monument) at 3,100′ elevation, near the crash site. Swedish power metal band Sabaton wrote a song on their 2014 studio album, Heroes, also entitled To Hell and Back, commemorating and recognizing Audie Murphy as one of the most decorated American veterans of World War II. David McClure, his collaborator on the book To Hell and Back, discovered Murphy's talent for poetry during their work on the memoir when he found discarded verses in Murphy's Hollywood apartment. One of those poems, "The Crosses Grow on Anzio", appears in To Hell and Back attributed to a soldier named Kerrigan. Only two others survived, "Alone and Far Removed" and "Freedom Flies in Your Heart Like an Eagle". The latter was part of a speech Murphy had written at a 1968 dedication of the Alabama War Memorial in Montgomery, and later set to music by Scott Turner under the title "Dusty Old Helmet". Murphy was a fan of country music, in particular Bob Wills and Chet Atkins, but was not a singer or musician himself. Through his friend Guy Mitchell, Murphy was introduced to songwriter Scott Turner in 1961. The two collaborated on numerous songs between 1962 and 1970, the most successful of which was "Shutters and Boards" and "When the Wind Blows in Chicago". ^ a b Murphy's son Terry is the President of the Audie Murphy Research Foundation, which in both its biographical sketch and Murphy Family Tree list his year of birth as 1925. Murphy's date of birth has been given as both 1924 and 1925 by Murphy himself. He seemed to go back and forth on the dates for the rest of his life. His sister, Mrs. Corinne Burns, as his nearest living kin, had signed a notarized document attesting to the birth date of 20 June 1924 that Murphy put on his enlistment application, falsifying his year of birth so he could meet the U.S. Army age qualification for enlistment. Subsequently, all military records show the purportedly falsified date as his birth date. His California driver's license showed a birth date of 1925. ^ Conflicting information exists as to Murphy's date and place of enlistment. The Audie L. Murphy Memorial website has scanned documents from the U.S. National Archives and Records Administration that include Corinne Burns' statement and Murphy's "Induction Record", which shows him "Enlisted at Dallas, Texas" on 30 June 1942, and the line above it says "Accepted for service at Greenville, Texas". The National Register of Historic Places Listing added the Greenville post office as historic site number 74002081 in 1974, citing it as Murphy's place of enlistment, possibly referring to the act the military termed "Accepted for service". The NRHP also shows his enlistment date as 20 June 1942 which might be the date he was accepted for service. ^ Murphy's war service was combat-related. Therefore, he did not receive the non-combat Soldier's Medal. Act of Congress (Public Law 446–69th Congress, 2 July 1926 (44 Stat. 780) established the Soldier's Medal for heroism "as defined in 10 USC 101(d), at the time of the heroic act who distinguished himself or herself by heroism not involving actual combat with the enemy.") At the end of his World War II service, Murphy became known as America's most decorated soldier. ^ The Officers' Reserve Corps was originally one of several units of the United States Organized Reserve that also included the Enlisted Reserve Corps, Reserve Officers' Training Corps and the Civilian Conservation Corps. The Organized Reserve was restructured during the Korean War and renamed the United States Army Reserve. The new structure was divided into the Ready Reserve, Standby Reserve and Retired Reserve. ^ The exact count on the number of feature films Murphy made varies by source. The Hollywood Walk of Fame and other sources put his total number of feature films at 44. ^ Henry Fleming is the Youth in Stephen Crane's novel. In the 1951 film, Fleming is played by Murphy as the unnamed character "The Youth". However, Fleming is addressed by name when other characters are speaking to him. ^ 56-minute uploaded on YouTube as Audie Murphy Attends Beverly Hilton Grand Opening 1955. He appears at 28:48 and briefly talks with Hedda Hopper about how he once gave his medals away but had them replaced by the U.S. Army. ^ Alden Pyle is the American in Graham Greene's novel. In the 1958 film, Pyle is played by Murphy as the unnamed character "The American". ^ The Audie L. Murphy Memorial Website has user-generated information on an Arizona quarter horse ranch Murphy purchased in 1956 and sold to Guy Mitchell in 1958. While not stating that the use of Murphy's name and image were authorized by his estate, the website of the Menifee, California residential development named "Audie Murphy Ranch" does claim it is the location of the ranch Murphy owned in California. Menifee was incorporated in 2008 and borders the community of Perris. ^ The actual award was presented by Governor Rick Perry to Murphy's family on 29 October 2013 at a ceremony in Farmersville, Texas. ^ a b Reyna, Charmaine (25 January 2013). "Lead From The Front: Sergeant Audie Murphy Study Guide" (PDF). Fort Lee. pp. 20–21. Archived from the original (PDF) on 22 December 2016. Retrieved 20 February 2017. ^ "BIOGRAPHY A short biographical sketch". Audie L. Murphy Memorial Website. Retrieved 12 October 2013. ^ "Scan of original Application for Degrees, N. Hollywood Freemasons" (PDF). Audie L. Murphy Memorial Website. Retrieved 12 October 2013. ^ "Scan of charred California driver's license for Audie Murphy, recovered from crash site after his death" (PDF). Audie L. Murphy Memorial Website. Retrieved 12 October 2013. ^ a b c d "Scan of service records 1942–1971" (PDF). Audie L. Murphy Memorial Website. Retrieved 27 October 2013. ^ Graham 1989, p. 5. ^ a b Murphy 2002, pp. 4–7. ^ "Celeste, Texas". Texas Historical Commission. Archived from the original on 4 March 2016. Retrieved 12 October 2013. ^ Simpson 1975, p. 28. ^ a b Murphy 2002, p. 7. ^ Minor, David. "Boles Home". Handbook of Texas Online. Texas State Historical Association. Retrieved 12 October 2013. ^ Tate 2006, pp. 152–63. ^ Murphy 2002, p. 143. ^ a b c Tate 2006, pp. 152–163. ^ "Scan of Audie Murphy's Service Record book" (PDF). Audie L. Murphy Memorial Website. ^ "NRHP Greenville Post Office". Texas Historical Commission. Archived from the original on 4 March 2016. Retrieved 12 October 2013. ^ "The Old Greenville Post Office". Texas Historical Commission. Archived from the original on 3 March 2016. Retrieved 12 October 2013. ^ Graham 1989, pp. 23, 24. ^ Graham 1989, p. 29. ^ Graham 1989, pp. 33–34. ^ Simpson 1975, p. 49. ^ Graham 1989, p. 36. ^ Champagne 2008, p. 41. ^ Champagne 2008, pp. 45–47. ^ Graham 1989, p. 37. ^ Graham 1989, p. 39. ^ Graham 1989, pp. 38, 39. ^ "Sicily 1943". CMH Pub 72-16. Center of Military History United States Army. Retrieved 12 October 2013. ^ Graham 1989, p. 40. ^ Graham 1989, p. 43. ^ Graham 1989, p. 44. ^ a b Graham 1989, p. 47. ^ Graham 1989, pp. 47, 48. ^ "Naples-Foggia 1943 1944". CMH Pub 72-17. Center of Military History United States Army. Retrieved 12 October 2013. ^ Graham 1989, pp. 48-49. ^ a b Champagne 2008, p. 106. ^ Graham 1989, p. 50. ^ "The Allied Offensive (30 January-1 February)". Anzio Beachhead CMH Pub 100-10. Center of Military History United States Army. pp. 28–36. Retrieved 12 October 2013. ^ Graham 1989, pp. 51, 52. ^ Champagne 2008, pp. 111–112. ^ Graham 1989, p. 54. ^ Graham 1989, pp. 58, 59. ^ Graham 1989, p. 59. ^ a b c d Tanber, George G. (5 May 2005). "Who Had More Medals? Depends on Who's Counting". Toledo Blade. p. 3. Retrieved 8 October 2013. ^ Simpson 1975, p. 102. ^ Simpson 1975, p. 276. ^ "Hall of Valor". Military Times. Archived from the original on 4 October 2013. Retrieved 12 October 2013. ^ Graham 1989, pp. 64-65. ^ a b c Brinkley 2004, p. 191. ^ Champagne 2008, p. 161. ^ a b "Southern France". CMH Pub 72-31. Center of Military History United States Army. Archived from the original on 12 March 2007. Retrieved 12 October 2013. ^ a b c Hollen, Staff Sergeant Norman (December 1944). "Statement describing Murphy's August 15, 1944 actions near Ramatuelle, France". U.S. National Archives and Records Administration ARC Identifier 299779. Retrieved 12 October 2013. ^ Clarke & Smith 1993, p. 166. ^ Simpson 1975, p. 124. ^ Graham 1989, p. 72. ^ Clarke & Smith 1993, pp. 285–296. ^ Simpson 1975, p. 128. ^ Simpson 1975, pp. 131–35. ^ Fredriksen 2010, p. 279. ^ Graham 1989, pp. 81–83. ^ Graham 1989, p. 82. ^ Simpson 1975, p. 137. ^ Clarke & Smith 1993, p. 533. ^ Graham 1989, p. 86. ^ Clarke & Smith 1993, pp. 543–44. ^ Simpson 1975, p. 153. ^ Graham 1989, p. 88. ^ a b Abramski, Pvt. First Class Anthony V. (27 February 1945). "Statement describing Murphy's 26 January 1945 actions at Holtzwihr". U.S. National Archives and Records Administration ARC Identifier 299775. Retrieved 12 October 2013. ^ Weispfenning, First Lieutenant Walter W. (18 April 1945). "Statement describing Murphy's January 26, 1945 actions at Holtzwihr". U.S. National Archives and Records Administration ARC Identifier 299785. Retrieved 12 October 2013. ^ Ware, Kenneth L. (18 April 1945). "Statement describing Murphy's January 26, 1945 actions at Holtzwihr". U.S. National Archives and Records Administration ARC Identifier 299784. Retrieved 12 October 2013. ^ "World War II Medal of Honor Recipients M-S". Center of Military History United States Army. Retrieved 12 October 2013. ^ Simpson 1975, p. 164. ^ Graham 1989, p. 95. ^ Simpson 1975, pp. 175–76. ^ Graham 1989, p. 96. ^ a b c d "The Price of Freedom: Americans at War". Smithsonian National Museum of American History. Retrieved 24 February 2014. ^ Dept. of Defense. "Award of the "Au Grade De Chevalier" for Murphy's exceptional services rendered during operations to liberate France., 07/19/1948". U.S. National Archives and Records Administration ARC Identifier 299781. Retrieved 12 October 2013. ^ Dept. of Defense (16 April 1945). "De La Croix De Guerre Award for Murphy's services rendered during operations to liberate France". U.S. National Archives and Records Administration ARC Identifier 299782. Retrieved 12 October 2013. ^ a b Simpson 1975, p. 410. ^ Edson, Lt. Colonel Hallet D. (17 February 1945). "Recommendation from Lt. Colonel Hallet D. Edson, 15th Infantry, to Award of Medal of Honor to Lieutenant Audie L. Murphy". U.S. National Archives and Records Administration ARC Identifier 299777. Retrieved 12 October 2013. ^ Lovett, Brigadier General R.B. (12 April 1945). "Recommendation from Brigadier General R.B. 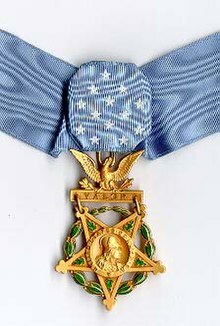 Lovett, to Lieutenant General A.M. Patch, for Audie L. Murphy to be awarded the Medal of Honor and General Patch's approval". U.S. National Archives and Records Administration ARC Identifier 299783. Retrieved 12 October 2013. ^ Willbanks 2011, p. 234. ^ "'War' excerpt about Staff Sgt. Salvatore Giunta's actions". Stars and Stripes. 10 September 2010. Archived from the original on 3 December 2010. Retrieved 16 November 2010. Oettinger, Callie (26 January 2011). Focus On Audie Murphy. Command Posts. MacMillan. ^ "Soldier's Medal" (PDF). U.S. Army Regulation 600-8-22: Military Awards. Department of the Army Administrative Publications. 23 June 2013. chapter 2, section II, 3–14. Archived from the original (PDF) on 17 October 2013. Retrieved 12 October 2013. ^ a b "Life Visits Audie Murphy". Life: 94–97. 16 July 1945. Retrieved 12 October 2013. ^ a b c "Scan of service records 1953–1971" (PDF). Audie L. Murphy Memorial Website. Retrieved 27 October 2013. ^ Graham 1989, p. 127. ^ Spiller & Dawson 2010, pp. 137–54, chpt Man Against Fire: Audie Murphy and His War. ^ "Scan of Audie L. Murphy signed request for his Good Conduct Medal, addressed to the Commanding Officer at Fort Sam Houston" (PDF). Audie L. Murphy Memorial Website. 21 August 1945. Retrieved 12 October 2013. ^ "Army Reserve, a Concise History" (PDF). United States Army Reserve. Archived from the original (PDF) on 16 April 2014. Retrieved 16 April 2014. ^ Murphy 2002, pp. 122–24. ^ Whiting 2001, p. 224. ^ Redfern 2007, pp. 67, 68. ^ Redfern 2007, pp. 65, 67-68. ^ Curtis & Golenbock 2009, p. 119. ^ Graham 1989, p. 183. ^ Murphy 2002, p. 125. ^ Simpson 1975, pp. 373–76. ^ Redfern 2007, p. 60. ^ Rosen 2012, pp. 149–51. ^ O'Reilly 2010, pp. 163–65. ^ "Audie L. Murphy Memorial VA Hospital". U.S. Department of Veterans Affairs. Retrieved 11 January 2014. ^ "About the South Texas Veterans Health Care System (STVHCS)". U.S. Department of Veterans Affairs. Retrieved 12 October 2013. ^ Teague, Congressman Olin (13 October 1971). "Designating the Veteran's Administration Hospital in San Antonio Texas As the Audie L. Murphy Veterans' Memorial Hospital". Congressional Record. Washington, D.C.: Audie L. Murphy Memorial Website. Retrieved 27 October 2013. ^ Dawson III, Joseph G. "Thirty-Sixth Infantry Division". Handbook of Texas Online. Texas State Historical Association. Retrieved 14 April 2014. ^ Simpson 1975, pp. 340–341. ^ "Audie Murphy's Commissioning Oath of Office paperwork" (PDF). NARA service document. ^ Simpson 1975, p. 342. ^ Simpson, Harold B. "Audie Leon Murphy". Handbook of Texas Online. Texas State Historical Association. Retrieved 12 October 2013. ^ Graham 1989, p. 194. ^ Tate 2006, pp. 157–58. ^ Simpson 1975, p. 339. ^ "Scan of Retired Reserve request" (PDF). Audie L. Murphy Memorial Website. 18 April 1969. Retrieved 14 April 2014. ^ "Audie Murphy profile". Hollywood Walk of Fame. Retrieved 30 December 2013. ^ Graham 1989, pp. 128–47. ^ Graham 1989, pp. 222–23. ^ Graham 1989, pp. 147, 148. ^ Nott 2005, pp. 1–3, 42–57, 111–12. ^ Graham 1989, p. 149. ^ Graham 1989, pp. 150–151. ^ Graham 1989, pp. 142, 174. ^ Graham 1989, pp. 145–46. ^ Movies of the Month (April 1949). "Bad Boy". Boys' Life: 50. Retrieved 22 May 2014. ^ Graham 1989, pp. 161–62. ^ Tate 2006, pp. 162–63. ^ Young & Young 2010, pp. 493–95. ^ Graham 1989, p. 177. ^ Graham 1989, p. 348. ^ Ross 1997, p. 100. ^ Mauldin, Bill (11 June 1971). "Parting Shots". LIFE. 70 (22): 77. Retrieved 22 May 2014. ^ Graham 1989, pp. 196–97. ^ Nott 2005, pp. 113, 117. ^ Roberts 2009, pp. 125–126. ^ Lucas 2004, pp. 175–77. ^ Nott 2005, pp. 51–22. ^ Graham 1989, pp. 231–32. ^ Yoggy 1998, p. 101. ^ Huebner 2007, pp. 140–43. ^ Gossett 1996, p. 15. ^ Niemi 2006, p. 90. ^ "Message to TAGO from H.D. Kight, Public Information Division, detailing an appearance on the Ed Sullivan Show by Audie L. Murphy". U.S. National Archives and Records Administration ARC Identifier 299780. 24 September 1955. Retrieved 10 October 2013. ^ Graham 1989, pp. 241–46, 261. ^ Graham 1989, p. 263. ^ Graham 1989, pp. 266–67. ^ Graham 1989, pp. 263, 268. ^ DiLeo 2004, p. 253. ^ O'Connor & Rollins 2008, pp. 407, 414–15. ^ Graham 1989, p. 264. ^ Cozad 2006, pp. 221–22. ^ Maltin 2008, pp. 994–95. ^ "Ford Startime. The Man LC control no. 96500439". Library of Congress. Retrieved 10 October 2013. ^ "Broken Bridge". U.S. National Archives and Records Administration ARC Identifier 2569746. 1974. Retrieved 12 October 2013. ^ Simpson 1975, p. 411. ^ Herzberg 2005, p. 153. ^ Graham 1989, p. 235. ^ Pitts 2012, pp. 14, 48, 114, 139, 357. ^ "Willard Willingham filmography". New York Times. Retrieved 6 January 2013. ^ Graham 1989, p. 354. ^ Basinger & Arnold 2003, p. 301. ^ Pitts 2012, p. 48. ^ Herzberg 2005, pp. 79–80. ^ Pitts 2012, p. 139. ^ Pitts 2012, p. 114. ^ Lewis 2002, p. 223. ^ Nott 2005, pp. 1–2. ^ Rausch & Dequina 2008, pp. 38-39. ^ Boggs 2011, pp. 189–94. ^ Graham 1989, p. 310. ^ Graham 1989, p. 174. ^ Nielsen Business Media, Inc (28 April 1951). "Divorces". The Billboard: 48. Retrieved 12 October 2013. ^ Nielsen Business Media, Inc (5 May 1951). "Marriages". The Billboard: 48. Retrieved 12 October 2013. ^ Nielsen Business Media, Inc (22 March 1952). "Births". The Billboard: 55. Retrieved 12 October 2013. ^ Simpson 1975, p. 269. ^ Graham 1989, p. 250. ^ "Homes Owned or Lived in By Audie Murphy". Audie L. Murphy Memorial Website. Retrieved 27 October 2013. ^ "Audie Murphy Ranch". Brookfield Residential. Retrieved 25 March 2014. ^ Graham 1989, pp. 256–58. ^ Graham 1989, p. 307. ^ Scott, Vernon (22 September 1968). "One-Time Hero Audie Murphy is Now Broke and In Debt". Sarasota Herald-Tribune. p. 8. Retrieved 12 October 2013. ^ Landon, Tom (9 June 2013). 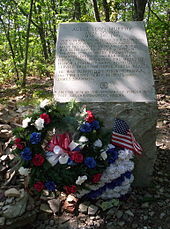 "Audie Murphy crash site now well marked". The Roanoke Times. Retrieved 12 October 2013. 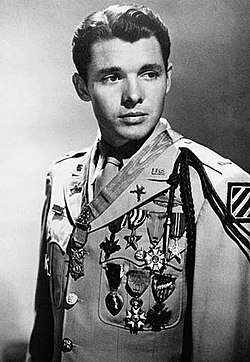 ^ "Hero-Actor Audie Murphy Dies In Plane Crash". Philadelphia Daily News at Newspapers.com. 1 June 1971. Retrieved 24 August 2018. ^ Maslowski & Winslow 2005, p. 420. ^ McCarthy, Dennis (14 April 2010). "Pam Murphy, widow of actor Audie Murphy, was veterans' friend and advocate". Los Angeles Daily News. Retrieved 12 October 2013. ^ Colorado Court of Appeals. "Murphy v. Colorado Aviation Inc". Leagle. Retrieved 12 October 2013. ^ "Audie Murphy Buried With Military Rites at Arlington". The New York Times. 8 June 1971. ^ Graham 1989, p. 338. ^ "Audie Murphy Biography". U.S. Army Fort Lee, Virginia. Retrieved 28 August 2018. ^ "Biography of Audie Murphy". Arlington National Cemetery. Retrieved 12 October 2013. ^ Richard L. Rodgers. "Audie Murphy Research Foundation". audiemurphy.com. ^ Cavileer 2013, p. 290. ^ "Inducted to the Walk of Fame on February 8, 1960 with 1 star". Hollywood Walk of Fame. Retrieved 12 October 2013. ^ "Gov. Perry Awards Audie Murphy Texas Legislative Medal of Honor". Press Release. Office of Governor Rick Perry. Archived from the original on 2 November 2013. Retrieved 29 October 2013. ^ Texas Legislature. "Bill HCR3 Legislative Medal of Honor". State of Texas. Retrieved 12 October 2013. ^ Slinkard, Caleb (21 August 2013). "Murphy finally gets medal". Herald Banner. Archived from the original on 13 October 2013. Retrieved 12 October 2013. ^ Root, Jay (20 June 2013). "Audie Murphy, a Texas Hero Still Missing One Medal". The New York Times. Retrieved 12 October 2013. ^ SABATON – To Hell And Back (OFFICIAL MUSIC VIDEO). YouTube. 15 May 2014. Retrieved 26 April 2015. ^ Simpson 1975, pp. 374–76. ^ Simpson 1975, pp. 371-73. ^ Graham 1989, p. 298. ^ Beck, Ken (30 November 1989). "Remembering a Musical Audie". The Tennessean. p. 1E. ^ Simpson 1975, p. 372. Basinger, Jeanine; Arnold, Jeremy (2003). The World War II Combat Film: Anatomy of a Genre. Wesleyan University Press. ISBN 978-0-8195-6623-2. Boggs, Johnny D (2011). Jesse James and the Movies. McFarland & Company, Inc. ISBN 978-0-7864-4788-6. Brinkley, Douglas (2004). The World War II Desk Reference. Collins Reference. ISBN 978-0-06-052651-1. Cavileer, Sharon (2013). Virginia Curiosities: Quirky Characters, Roadside Oddities & Other Offbeat Stuff. Globe Pequot Press. ISBN 978-0-7627-9520-8. Champagne, Daniel R (2008). Dogface Soldiers: The Story of B Company, 15th Regiment, 3rd Infantry Division: from Fedala to Salzburg, Audie Murphy and His Brothers in Arms. Merriam Press. ISBN 978-1-4357-5767-7. Clarke, Jeffrey J; Smith, Robert Ross (1993). Riviera to the Rhine. United States Army in World War II. Center of Military History, United States Army. ISBN 978-0-16-025966-1. Cozad, W. Lee (2006). More Magnificent Mountain Movies. Sunstroke Media. ISBN 978-0-9723372-3-6. Curtis, Tony; Golenbock, Peter (2009). American Prince: A Memoir. Three Rivers Press. ISBN 978-0-307-40856-3. DiLeo, John (2004). 100 Great Film Performances You Should Remember – But Probably Don't. Limelight Editions. ISBN 978-0-87910-972-1. Fredriksen, John C. (2010). The United States Army: A Chronology, 1775 to the Present. ABC-CLIO. ISBN 978-1-59884-344-6. Gossett, Sue (1996). The Films and Career of Audie Murphy. Empire Publishing. ISBN 978-0-944019-22-1. Graham, Don (1989). No Name on the Bullet. Viking. ISBN 978-0-670-81511-1. Herzberg, Bob (2005). Shooting Scripts. McFarland & Company, Inc. ISBN 978-0-7864-2173-2. Huebner, Andrew J (2007). The Warrior Image: Soldiers in American Culture from the Second World War to the Vietnam Era. The University of North Carolina Press. ISBN 978-0-8078-3144-1. Lewis, C. Jack (2002). White Horse, Black Hat: A Quarter Century on Hollywood's Poverty Row. Scarecrow Press. ISBN 978-0-8108-4358-5. Lucas, John Meredyth (2004). Eighty Odd Years in Hollywood: Memoir of a Career in Film and Television. McFarland & Company, Inc. ISBN 978-0-7864-1838-1. Maltin, Leonard (2008). Leonard Maltin's 2009 Movie Guide. Plume. ISBN 978-0-452-28978-9. Maslowski, Peter; Winslow, Don (2005). Looking for a Hero: Staff Sergeant Joe Ronnie Hooper and the Vietnam War. University of Nebraska Press. ISBN 978-0-8032-3244-0. Murphy, Audie (2002) [First published 1949]. To Hell and Back. Henry Holt and Co. ISBN 978-0-8050-7086-6. Niemi, Robert (2006). History in the Media: Film And Television. ABC-CLIO. ISBN 978-1-57607-952-2. Nott, Robert (2005). Last of the Cowboy Heroes: The Westerns of Randolph Scott, Joel McCrea, and Audie Murphy. McFarland & Company, Inc. ISBN 978-0-7864-2261-6. O'Connor, John E.; Rollins, Peter C (2008). Why We Fought: America's Wars in Film and History. The University Press of Kentucky. ISBN 978-0-8131-2493-3. O'Reilly, Bill (2010). Pinheads and Patriots: Where You Stand in the Age of Obama. William Morrow. ISBN 978-0-06-195071-1. Pitts, Michael R. (2012). Western Movies: A Guide to 5,105 Feature Films. McFarland & Company, Inc. ISBN 978-0-7864-6372-5. Rausch, Andrew J; Dequina, Michael (2008). Fifty Filmmakers: Conversations With Directors from Roger Avary to Steven Zaillian. McFarland & Company, Inc. ISBN 978-0-7864-3149-6. Redfern, Nick (2007). Celebrity Secrets Official Government Files on the Rich and Famous. Paraview Pocket Books. ISBN 978-1-4165-2866-1. Roberts, Jerry (2009). Encyclopedia of Television Film Directors. Scarecrow Press. ISBN 978-0-8108-6378-1. Rosen, David M (2012). Child Soldiers. ABC-CLIO. ISBN 978-1-59884-526-6. Ross, Lillian (1997). Picture. Modern Library. ISBN 978-0-679-60254-5. Simpson, Harold B. (1975). Audie Murphy, American Soldier. Hill Jr. College Press. ISBN 978-0-912172-20-0. Spiller, Roger J; Dawson, Joseph G (2010). The Texas Military Experience: From the Texas Revolution Through World War II. Texas A&M University Press. ISBN 978-1-60344-197-1. Tate, J.R. (2006). Walkin' with the Ghost Whisperers. Stackpole Books. ISBN 978-0-8117-4544-4. Whiting, Charles (2001). America's forgotten army: the story of the U.S. Seventh. St. Martin's Paperbacks. ISBN 978-0-312-97655-2. Willbanks, James H (2011). America's heroes: Medal of Honor Recipients from the Civil War to Afghanistan. ABC-CLIO. ISBN 978-1-59884-394-1. Yoggy, Gary A. (1998). Back in the Saddle: Essays on Western Film and Television Actors. McFarland & Company, Inc. ISBN 978-0-7864-0566-4. Young, William H; Young, Nancy K. (2010). World War II and the Postwar Years in America: A Historical and Cultural Encyclopedia. ABC-CLIO. ISBN 978-0-313-35652-0. Smith, David A. (2015). The Price of Valor: The Life of Audie Murphy, America's Most Decorated Hero of World War II. Regnery History. ISBN 978-1-62157-317-3.